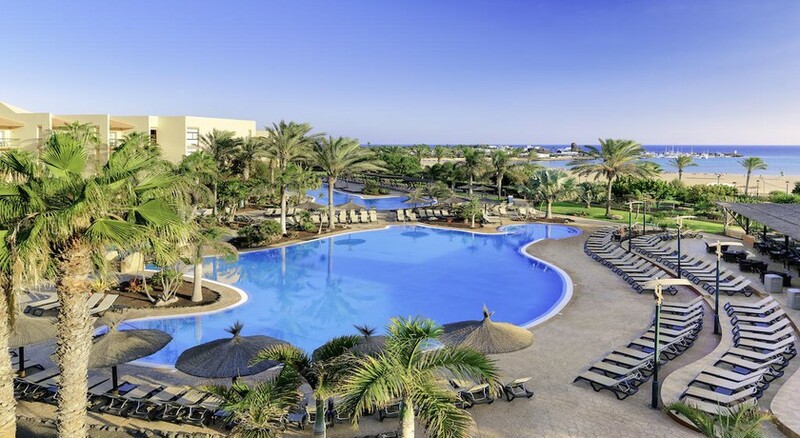 Ideally located on the popular Caleta de Fuste Beach on the Canary Island of Fuerteventura, Barcelo Fuerteventura Thalasso Spa Hotel is a perfect destination for family or couple holidays. The 4-star hotel boasts beautifully decorated guestrooms with fantastic sea views, a buffet restaurant serving Canarian fare as well as international cuisines, and a delightful poolside bar. When it comes to entertainment, Barcelo Fuerteventura offers a host of sports and leisure activities. Guests can enjoy tennis, basketball, beach volleyball or football on site, or tee off at the 18-hole Salinas de Antigua Golf Club in the vicinity. The nearby Caleta de Fuste town centre buzzes with restaurants, shops and bars. Thalasso Spa, the hotel’s thalassotherapy centre, is the only one in Fuerteventura and offers a range of treatments to pamper the body and mind. The beach is just a five-minute walk from the hotel and is ideal for indulging in watersports. There are also two swimming pools for adults and a pool for children to make a splash. The hotel has a kids’ playground with play castles, a mini club and loads of activities for the whole family. Located right on the edge of Caleta de Fuste beach, Barcelo Fuerteventura Thalasso Spa is just a 5-minute walk from sunny sands (500 metres). It is also close to the marina and the commercial centre of the resort. Fuerteventura Airport is 7 km from the hotel. Among the nearby attractions, the Salinas Salt Museum is 3km away and the Salinas de Antigua golf course is 2km from the hotel. 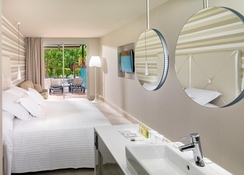 The 462 spacious guestrooms and suites at Barcelo Fuerteventura Thalasso Spa are divided into six categories. They combine amazing views, modern amenities and friendly service. The rooms can accommodate up to five individuals in total – two adults and two-three children – and they are equipped with a terrace or balcony with garden, pool or sea views, LCD TV, free Wi-Fi, air conditioning, fully equipped bathroom with rainfall shower, telephone, minibar (charge), safe (charge), sofa bed and a pillow menu. Some of the rooms give guests free access to Thalasso Spa. For couples or families looking for a special stay, a selected number of rooms in the hotel feature a private hot tub on the terrace for hydromassage. Dining is a hearty affair at Barcelo Fuerteventura Thalasso Spa, with the main restaurant Maxorata serving typical Canarian style cuisine and international cuisine in buffet style. The restaurant’s wide outdoor terraces offer wonderful views over the beach and the swimming pools. The on-site Tabaida bar is a great place to sample delightful cocktails accompanied with top-quality dishes. There’s also the wonderful Aloe snack bar in the pool area, where guests can have a drink or snack at any time of day either in the pool or while sunbathing on the loungers. Guests under the all-inclusive scheme enjoy breakfast, lunch and dinner at the Maxorata buffet restaurant and snacks at the Aloe bar.